Part 6: Financial Markets and the Macroeconomy. 19. Asset prices, consumption, and the business cycle (J.Y. Campbell). 20. Human behavior and the efficiency of the financial system (R.J. Shiller). 21. The financial accelerator in a quantitative business cycle framework (B. Bernanke, M. Gertler and S. Gilchrist). Part 7: Monetary and Fiscal Policy. 22. 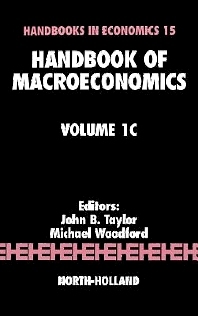 Political economics and macroeconomic policy (T. Persson, G. Tabellini). 23. Issues in the design of monetary policy rules (B.T. McCallum). 24. Inflation stabilization and BOP crises in developing countries (G.A. Calvo, C.A. Vegh). 25. Government debt (D.W. Elmendorf, N.G. Mankiw). 26. Optimal fiscal and monetary policy (V.V. Chari, P.J. Kehoe). This text aims to provide a survey of the state of knowledge in the broad area that includes the theories and facts of economic growth and economic fluctuations, as well as the consquences of monetary and fiscal policies for general economic conditions.